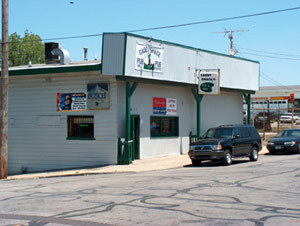 Scooter’s 70th bar, first visited in 2006. Caddyshack, or “The Shack” as many of the regulars refer to it, is a popular dive bar and night spot for downtown Kansas City barhoppers. On our first visit in 2006 we were warmly greeted by our bartender, who asked our names and immediately engaged us in conversation. The owner, Joe, came out to meet us as well. On subsequent visits we have learned that Joe makes it a habit of getting to know his customers, circulating among the crowd saying hello and making conversation. The interior of the bar is divided into two main sections. The front section contains booths and low tables surrounded by office chairs. The back section contains a mix of high and low bar tables interspersed among the pool tables. Caddyshack features free popcorn, optionally seasoned with their special blend of spices, and has recently begun making their own pizza. The pizza is Sicilian style, based upon a recipe Joe has been making for over 30 years, and is available until 2:00am. Other standard bar foods are also available. Entertainment includes pool tables and other usual bar games. About once a month they have a karaoke night that is wildly popular, often drawing standing-room-only crowds. In 2007 though early 2008 Caddyshack underwent an extensive renovation. In addition to fixing up the bathrooms and cleaning up the interior, the unused back patio was closed and a new, much bigger patio was built on the building’s east side. The picture a the top this article was taken before construction, the new patio sits off the right-hand side of that photo. This patio is now one of the busiest spots downtown after 1:30am.